Upward to Financial Security provides education and training to spread financial awareness and conduct financial literacy training to individuals and families to raise expectations for people with intellectual and other developmental disabilities to develop financial assets. North Carolinians with intellectual and other developmental disabilities (I/DD) struggle to get by, make ends meet, and be part of the economic mainstream. Only 30% of North Carolina residents with disabilities are working compared to 70% of nondisabled peers. More individuals with disabilities (30%) live in poverty compared to those without disabilities (14%). Many individuals with disabilities have never managed a budget, applied for an assistive technology loan or understood how to build assets. Approximately 50% of adults with disabilities do not use banking services, and nearly 50% of people with disabilities have no savings. Knowledge gap in the disability community as it pertains to work incentives within various public support programs. Identify and utilize strategies to equip individuals with financial knowledge. Improve collaboration between the disability and financial stability communities to improve the financial health of NC residents with I/DD, their families and other key stakeholders. Design a robust menu of activities to integrate financial stability efforts into existing disability services. Leverage current best practices, develop a comprehensive plan, and launch an integrated communications initiative to connect individuals and families with financial resources. Update, expand and refine the curriculum materials developed by National Disability Institute (NDI) and tailor the information specifically for NC residents. Execute “train the trainer” models to build the capacity of disability organizations to use the curriculum with the target audience and sustain the needed support. Offer incentives such as awards, recognition and mentorship to target audience to increase use of financial skills. Leverage public/private sector partnerships to create a resource map and tools for individuals and stakeholders. Host a train-the-trainer event to include individuals who are bilingual on the Upward to Financial Stability curriculum. Building Resource Guide is now available.• Resource map and North Carolina Asset Building Guide was made available to the community through the NDI website. Over 250 copies were downloaded or provided to the public over the course of this initiative. Updated and enhanced financial literacy and asset-building curriculum including new modules and tools covering NCABLE, housing and employment, and paying for secondary education were added. April 2018 hosted a train-the-trainer event to include individuals who were bilingual on the Upward to Financial Stability curriculum. 10 copies of the Spanish curriculum were distributed during the training. Eighteen Master Trainers completed requirements to be Master Trainers during this initiative. Over 600 self-advocates and advocates participated in Upward to Financial Stability webinars that were part of this initiative. Upward to Financial Security Curriculum trainers have provided trainings to over 2,000 stakeholders as of April 30, 2018. Two-part webinar covering NCABLE was hosted by NDI with 93 participants. Promoted opportunities for people with I/DD to advance economic self-sufficiency by developing financial literacy and asset-building knowledge and skills. Created statewide resource for individuals with I/DD, families, service providers and key stakeholders in both the disability and financial stability communities in NC. 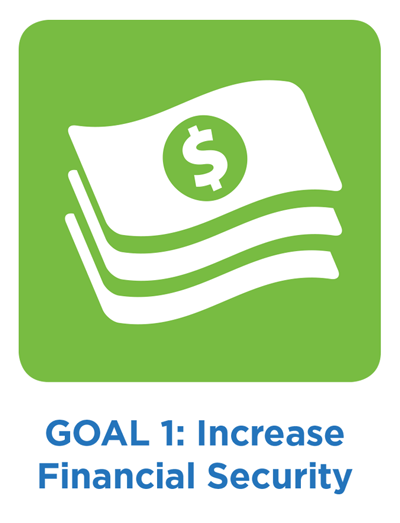 Increased the capacity of public and private resources to connect employment and transition goals with economic goals. Increased public awareness on the importance of financial stability for persons with disabilities. Click here for the NC Asset-Building Resource Guide. Click here for the NC Asset Building Resource Guide in Spanish.